Flint Drilling Tools found in the Upper Oligocene. From the collection at the Royal Institute of Natural Science in Belgium. At the junction of paleontology and archaeology are some fascinating artifacts that have been discovered in rock layers supposed to be many millions of years old. Controversial finds like these are often obscured and forgotten by modern scientists. In their massive, 900 page book, Forbidden Archaeology: The Hidden History of the Human Race, authors Michael Cremo and Richard Thompson present an overwhelming array of anomalous evidence that challenges the prevailing story of human origins. 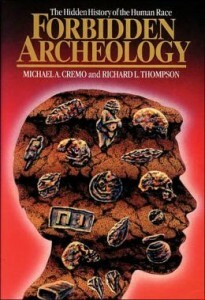 The book begins with a thorough discussion of incised and broken bones, evidence of human activity from strata dated between the Pleistocene and Eocene. 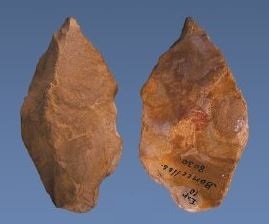 There follows a compelling presentation of flint tools that bear evidence of human workmanship, like the scraping and boring tools from the Red Crag in England (Pliocene-Eocene). After completely reviewing the evidence, the authors conclude that double standards, prejudice, and buried evidence have led the scientific establishment to a completely flawed view of human origins. 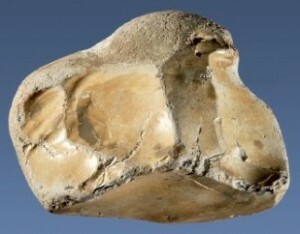 Flint Hammer Tool from Wimereux, Pas-de-Calais in France. This sand layer is dated by evolutionists to the lower Paleocene, nearly the time of the dinosaurs.